You don't believe in war, but's what's that gun you're totin'? Ah, you don't believe we're on the Eve of Destruction. Don't you understand what I'm tryin' to say? Can't you feel the fear that I'm feelin' today? There'll be no one to save with the world in a grave. And a handful of Senators don't pass legislation. When human respect is disintegratin'. This whole crazy world is just too frustratin'. But when you return, it's the same old place. Hate your next door neighbor, but don't forget to say grace. "Eve of Destruction" is a protest song written by P. F. Sloan in 1965. 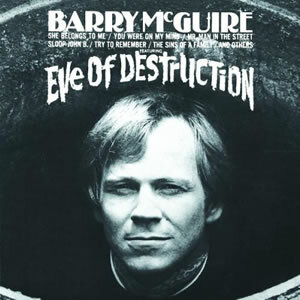 Several artists have recorded it, but the best-known recording was by Barry McGuire. This recording was made between July 12 and July 15, 1965 and released by Dunhill Records. The accompanying musicians were top-tier LA session players: P. F. Sloan on guitar, Hal Blaine (of Phil Spector's "Wrecking Crew") on drums, and Larry Knechtel on bass. The vocal track was thrown on as a rough mix and was not intended to be the final version, but a copy of the recording "leaked" out to a DJ, who began playing it. The song was an instant hit and as a result the more polished vocal track that was at first envisioned was never recorded. McGuire's single hit #1 on the US Billboard Hot 100 and #3 on the UK Singles Chart in September 1965.